At The Hacker Exchange, we’re really proud of our students – or HEX-ies, as we call them. In just one short year, we’ve been lucky to spend time with budding inventors working to alleviate Type 1 diabetes, ‘ethical hacking’ enthusiasts, FinTech founders, creative graphic and UX designers, and corporate innovation warriors at EY, Australian Unity and Telstra. Here, we’ve spoken to one of our very first HEX-ies, Kate Abbott, who gave us a deeper understanding into the student experience; and how HEX helped her change her outlook on business for the better. HEX: Good morning Kate, thank you for being here with us today. After your trip to Silicon Valley, how would you rate your experience and why? Kate: My experience at Silicon Valley – I would rate it a 10/10, purely because there is nothing I have done in the past that I can even begin to compare it to. 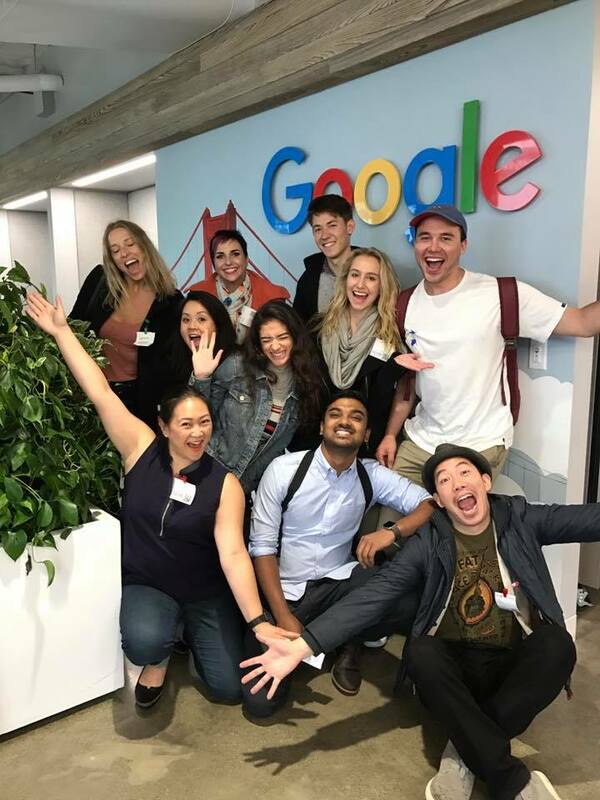 I have done a lot of other initiatives and accelerators, but at HEX they not only gave us the opportunity to explore our own business ideas but also to see how other companies worked – like when we toured around Google and LinkedIn. HEX: As a student, how do you believe you best benefited from your time in Silicon Valley? Kate: As an Entrepreneurship student, I believe I benefited more on a personal growth level. When you’re at uni you don’t always feel like you’re going to remember what you’ve been taught and apply the knowledge that you’ve learnt. Once you go to Silicon Valley I got to see how these skills are applied and I was able to believe in myself more. This program gave me the confidence I needed to be able to go into the workplace. HEX: How do people respond when you tell them about your experiences to Silicon Valley? Kate: They think it’s an amazing concept and a couple of my peers have applied to this program. My friends have already finished Uni, but they really wanted to go because they were struggling to find out where they wanted to go next in life and to find their passion. I told them it’s not just about starting a business – but more so, HEX gives you a broader understanding of what’s going on around the world and gives you connections and community. HEX: What were your intentions before you went to Silicon Valley? Did you have a specific goal or state or mind? Kate: Before I went, I had a few business ideas that I wanted to play around with. Even though I’ve done Entrepreneurship for my major, I felt like there was a gap in taking that first step to take my ideas to the next level. For me personally, it helped me come through a phase where I lacked confidence. Going to Silicon Valley made me change that perspective. People in San Francisco would ask me ‘why are you doubting yourself? You actually do have a lot of capabilities and strengths and you can do whatever you want to do, you just have to believe in yourself’ and that really helped me with my confidence. HEX: Why did you originally think this experience would be beneficial to you? Kate: Everyone talks about entrepreneurship being the heart of San Francisco, so I thought ‘what better place do an exchange?’. I thought that it would be a really great experience and something that I can add to my resume. It’s something nobody else around me had done before and I wanted to be a part of that. HEX: You wanted to stand out? HEX: Do you consider yourself to be a high achiever? Kate: I do see myself as a high achiever. I have had to do a lot of catch-up work in the past as a result of some poor health so I want to be normal – but I want to be more than normal, I want to be extraordinary! HEX: What was your favourite memory of Silicon Valley? Kate: There were so many! We were always having good banter and it was just always fun! I think getting to see the established startup companies was really amazing, and to be able to speak to the people who work there… I could never have imagined doing that if I went to San Francisco on my own so that was really awesome. HEX: Would you recommend this program to students who want to build a startup of their own? Kate: Definitely, I think anyone who has a business idea can find it really hard to get into that headspace or know who to speak to. This program really gives you the community connections to get it up and running. It’s hard to get into that scene when you’re not already in that scene and people don’t know where to go. So going overseas and meeting like-minded people can really help in that regard. HEX: What was the most significant insight you gained while on the program? Kate: For me it was financial models, they broke it up in a way that made me understand, I never really understood that concept in my degree, but being over there, the mentors gave real-life examples and that helped me understand which model was best for which business idea. Another concept was market validation – the mentors and coaches explained the best way to approach product-market fit for whenever you need to pitch your business to your future investors. HEX: What are your aspirations for the future? Has coming to Silicon Valley and being a part of the HEX program changed your future career plans? Kate: I really want to get into digital marketing and social media marketing. Sheryl Thai [CEO, League of Extraordinary Women and Founder of Cupcake Central] who was in SF with us spoke about it and the importance of it in her business. I also want to be involved in entrepreneurship projects in businesses, even if that doesn’t mean having my own business, it’s important for me to have that flexibility and ability to do the sort of projects that are outside of the norm. HEX: How has this experience equipped you to answer job interview questions? Kate: HEX students came from a very varied range of experience and age levels – but it didn’t matter. Everyone listened to everyone, and it made me realise that even when you go into an interview for example, that age isn’t important. It’s actually what you know, what you have to say that makes people listen to you. HEX: Has your overall approach to business and decision making changed since going to Silicon Valley? Kate: I would approach business more confidently and have the attitude that I can only do my best and not feel the need to change who I am. I can bring about the entrepreneurship aspects that I’ve learnt and help the Melbourne ecosystem develop further. With experience comes more confidence and more of a carefree attitude in terms of speaking up and not being so constrained within the standards of today’s business. You have to ask questions. Don’t be fearful, just get on with it and try as much as you can. HEX: What are you up to now? Kate: I Just graduated from a Bachelor of Business (Entrepreneurship), with a Minor in Marketing. I think it’s time for a short break! HEX: You’re going back to America soon, is that right? Kate: I’m going overseas on a girls’ trip and I’m going to meet up with [Hacker Exchange co-founder] Bevis when I’m over there. One of the girls I’m travelling with is actually on the HEX December cohort too! Thanks Katie – we wish you all the very best. Applications for San Francisco in December 2017 or February 2018; and Tel Aviv in January 2018 are open now.